An exceptionally emotive vocalist with a string of first class deep soul numbers to his credit, Joe Valentine is a music man of many parts. He writes and produces almost all his own material, he’s ran record labels and has his own club in Austin, TX. For some reason, despite all this activity over a very productive 50 year career in music, he has never really got the critical or financial credit his talents warranted. Maybe that’s down to luck, or an absence of promotion, or a lack of managerial “push” – but whatever the reason, to fans like myself his recorded legacy is a really strong one, and he is an artist who deserves a much higher profile in the soul world. Joe was born in New Orleans and has been in the music business since he was 14. He started his career with the Mitchell Lennox Rhythm Swing Band, being their featured vocalist for two years. He cut his first 45 for the tiny local Merit label at the age of 16. The uptempo “I Still Love You” jumps about as only Crescent City music can and the downbeat “Young Lover” is a blues ballad on which his vocal belies his tender age. His second release coupled the impassioned mid paced R & B of “Coming On Home” with a fine slow dirge-like She’s Gone Again on which his emotionally charged vocal chimes perfectly with the mood. This 45 first appeared on Rachan, but saw a second outing on Athens. 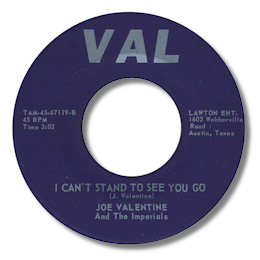 Around this time Joe formed his own band, whom he called the Imperials, although they weren’t name checked until a little later in the 60s when he started his own Val concern. By now Joe had relocated to Baton Rouge where he found a long term residency at the Carousel Club. And based there he had a further 45 on Doug, another label so small it’s likely that “Sweeter Than Sugar (And Twice As Nice)” / “I Need You” (also called “Let It Be Love” on some copies of the 45) was the only release. The top side is another bouncy chugging NOLA styled number, while the flip is another dead slow blues ballad which features some fine solo trumpet. It would not surprise me in the slightest to hear that these tracks came from the same session that produced the Rachan / Athens 45. In 1967 Valentine started his own Val label with Austin, TX addresses and both the 45s he issued were masterpieces. “One Night Of Satisfaction” is strong southern soul, with just a hint of funk in the rhythm to keep the dancers on their toes. The flip is something else. I Can’t Stand To See You Go is really outstanding deep soul from Joe’s pleading opening through the horn led chord changes and the middle section rap to the fiery and down-on-my-knees run out. 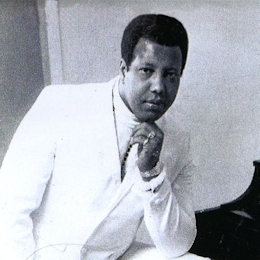 Valentine still had contacts back in Baton Rouge and he was able to interest local musical chief Stan Lewis in the tracks, who put the disc out on his own Ronn imprint. 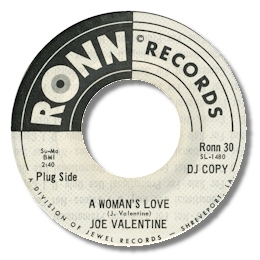 From a Northern soul point of view, Joe’s second Val 45 is the one that counts, thanks to the insistent uptempo “I Lost The Only Love I Ever Had”, but despite it’s catchy tune and southern soul rhythm it’s the flip that deserves all the plaudits. Surely I’ll Never Do You Wrong (aka "You've Got To Believe In Me") is if anything even more desperate than his previous effort. Hoarse with emotion Joe really can’t make his lyrical interpretation any more effective, as the big band plays on with a plodding deliberation that tugs at the heart strings. Just check out the way he almost loses control as the song ends – just amazing. Lewis passed on this one but did issue a second Valentine single which included arguably his best ever recording, A Woman’s Love. This track really is deep soul heaven. Set out in the grand manner – a 12/8 time signature, arpeggio guitar, big horn section – this track hits all the targets. Joe is simply sensational here – superb timing and authoritative use of volume control added to such a gritty tone make this a master class of soul balladry. From this exceptionally fertile period in Joe’s career there are several other recordings by Joe which remained in the can until they were showcased by various Japanese and UK reissues in the 1980s. These include the uptempo “Soul City USA” (not the Spencer Wiggins tune) and the fine I Can Feel My Love Coming On Strong. In less exalted company this track alone would be enough to satisfy the most demanding deep soul buff. In 1971 Joe became Joe Tex’s band leader, a position he held for a couple of years touring in Europe as well as all over the US. After a long absence from the recording studio Joe came back in 1979 with a new release on Cocoa Studio which sadly wasn’t a patch on his earlier work. In the 80s he formed a new label called Tee-Jay, and issued material on himself and Lynn Young and Linda Green. Despite the continuing high quality of the writing and the singing, unfortunately a lot of these recordings suffer badly from synthesiser overload. Easily the most palatable to my ears is highly melodic “Our Love Will Last Forever”. Not surprisingly a lot of the wonderful rough edges have gone from Joe’s voice but there is still more than enough left to make this a quiet storm ballad to treasure. I’m pleased to say that Joe has continued releasing material into the new century. His most recent output has been two CDs entitled "Love Is On Your Mind" and "From The Soul" which contain tracks recorded in the 80s and 90s. He has a weekend gig the 311 Club in Austin, TX where he continues to make his home. UPDATE ~ I have heard from several sources the very sad news that Joe passed away on 13 July 2018. Another good man gone. 1. 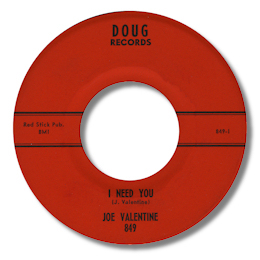 The Doug 45 was also issued with “Let It Be Love” as the flip – but the song is identical to “I Need You”. 2. Joe has issued two further CDs of original material from his catalogue. The first “Then” deals with the 60s and the 70s, “And Now” covers the following decades. The music on these CDs is included in the discography and so the CDs are a cheap way of getting a lot of Joe’s best songs. But be aware the quality of the pressings is very poor – neither of my copies would play properly in any of my CD players. Best stick with the download option. 3. You can find "A Woman's Love", "Can't Stand To See You Go", "I Can Feel My Love Coming On Strong" and "You've Got To Believe In Me" on the Westside UK CD "Soul Jewels Vol 1". Thanks as always to Bosko Asanovic for extra discographical info.